Eric Briffard, a Michelin-starred chef, tells us about his career, his first steps in cuisine and his most beautiful memory: his title of One of the Best Craftmen in France. How did you become a cuisine Chef? My relationship with cuisine began when I was a child. I am from the city of Auxerre, in Burgundy, and my grandparents, who were farmers, worked the land. My childhood was infused with authentic flavours and the best ingredients. My path to becoming a cuisine chef was clearly mapped out. Can you remember your first steps in cuisine? I remember making my first caramels at the age of 7, under the watchful eye of my grandmother. To this day, they are the best caramels I have ever tasted because they were made with the skin of boiled milk whose grassy flavours were out of this world. I was also close to my father who loved cooking and spent a lot of time watching him preparing dishes, I was a curious child who loved food. The year was punctuated with family meals and the dinner table was always spread with an abundance of delicious recipes. Being so close to products, and nature, awakened my gourmet personality. I began my apprenticeship at the age of 14 in a restaurant in Burgundy, Le Relais Saint Fiacre; it was on the job training and we worked extremely hard. It was fairly tough for someone so young but taught me an enormous amount. At that time, the world of cuisine was recommended for those who were struggling at school. It was a profession which was not as acclaimed as it is today. I entered my first cuisine competitions at the age of 16 and this was a real kick-start, one victory lead to another. At the age of 19, I headed to Paris to start working in a sizeable hotel kitchen brigade. Entering the compagnonnage (trade guild), gave me the opportunity to be trained by the best Chefs. I went to Japan at the age of 28, to take on my first role as Chef at the Royal Park Hotel in Tokyo, enabling my curiosity to be nurtured. Two years later, I was contacted by Joël Robuchon, who asked me to become his assistant at his restaurant, Le Jamin, in Paris. Hard work, discipline and attention to detail led me to being awarded the highest accolade in my profession, the title of One of the Best Craftsmen in France (Meilleur Ouvrier de France - MOF) in 1993. 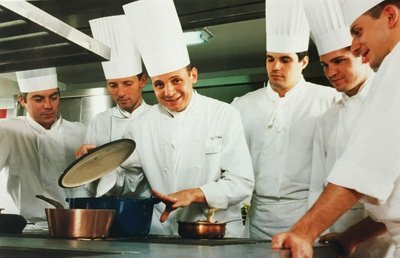 I went on to manage the kitchens of the Plaza Athénée hotel in Paris and its gastronomic restaurant, Le Régence, where I was awarded 2 stars by the Michelin guide in 2000, despite being one of the youngest Chefs in France in a luxury hotel. In 2008, I took over the reins of the Four Seasons George V hotel’s kitchens, in Paris, and of Le Cinq restaurant, until 2015, where my cuisine was once again awarded two Michelin stars. When did you become One of the Best Craftsmen in France (Meilleur Ouvrier de France - MOF)? Can you tell us about this amazing experience? It was in 1993. To be crowned One of the Best Craftsmen in France (Meilleur Ouvrier de France - MOF) was very close to my heart. I entered a lot of competitions as a Compagnon (member of the trade guild), it was an entirely logical step to enter the MOF competition; it represents the holy grail in my profession in France. When I think about it, it was the most emotional moment of my career! I won the final at the end of 1993, in Strasbourg, when the results are announced and you hear your name called, it is so emotional, it brings tears to your eyes! I joined Chef Joël Robuchon on the podium in front of all the cameras and he tapped me on the cheek while embracing me and said “not bad” (laughing), it was a real high point. We celebrated our victory at Paul Bocuse’s restaurant, L’abbaye de Collonges, and I was awarded my medal by President François Mitterrand at the Elysée Palace. It was extremely emotional and a dream come true, recognition from my peers. What made you decide to teach after such a long gastronomic adventure? A cuisine Chef is constantly sharing. It is essential that sharing does not become monotonous; every student is a unique individual on whom you can leave a lasting impression. Why Le Cordon Bleu Paris? First and foremost, I was blown away by Mr. André Cointreau, who has had the ingenuity to develop a network of Culinary Arts and Hospitality Management institutes around the globe! 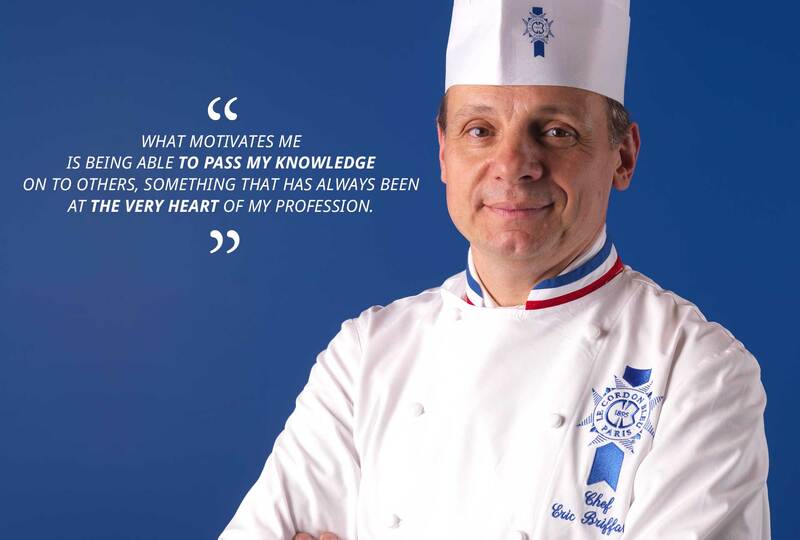 My objective today is to teach my expertise, my passion, at the new Le Cordon Bleu Paris campus. Le Cordon Bleu encourages openness to the rest of the world which was also something that really appealed to me. A wide range of world cuisines can be discovered thanks to way in which our schools communicate. All these factors made it quite obvious to me that the Le Cordon Bleu was the one. What is it that gives a Diploma at Le Cordon Bleu Paris institute that “extra” special something? What sets Le Cordon Bleu institutes apart is the fact that they welcome students from the world over in 35 schools. Students have access to an international network, and an alumni network, of extraordinary students around the globe. Le Cordon Bleu enables passionate men and women to follow an intensive training programme, taught by top professionals, in an Institute which provides the best tools for learning, expressing oneself and receiving personalised support. There are also many opportunities for interaction with professionals in our campus. When I see how much our students have progressed in just 9 months at the end of their Grand Diplôme training programme, for example, it is extraordinary. They leave with solid foundations in cuisine, boulangerie or pastry. The majority of our students go on to carry out an internship, giving them the opportunity to be in close contact with professionals in the fields of cuisine, pastry but also boulangerie, wine, hospitality management … There is no other school in the world that trains as many students in the Culinary Arts. It is something which is quite unique to this network. What kind of feedback do you get from Chefs and restaurant managers where Le Cordon Bleu Paris students carry out their internships? Today, the following is quite clear: at Le Cordon Bleu Paris school, we have the capability to place our students in the best establishments in Paris and in France. This demonstrates that our training programmes are recognized at the very highest level. Numerous prestigious Chefs give us both their time and their recognition. Le Cordon Bleu is a network of schools bursting with energy and which fully interacts with all players in the profession. My first cuisine memory? Soft caramels with my grandmother. Favourite smell in cuisine? Toast. Managing or teaching? Managing, I have been doing it for the past 20 years. France’s capital of gastronomy? Spontaneously I would say Lyon (SIRHA, Mr. Paul Bocuse, the Mères Lyonnaises (mothers of Lyon), the bouchons (small bistros where the key traditions of Lyon are maintained)). Establishments which marked your career? 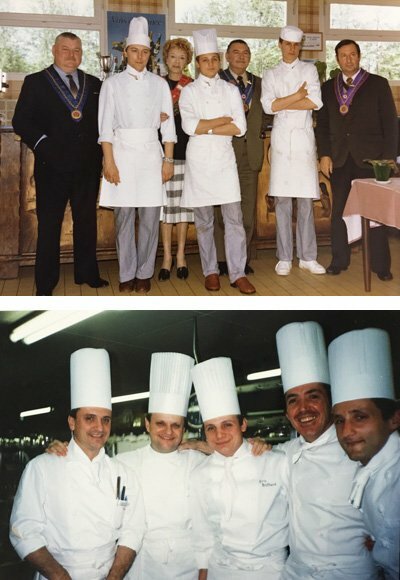 L’espérance in Vézelay with Marc Meneau, Le Manoir de Paris with Philippe Groult, Le Palazzo in Tokyo, Jamin restaurant and 59 Raymond Poincaré in Paris with Joël Robuchon. An exceptional restaurant you enjoy going to? Every Chef has their own style, quality and vision; I enjoy eating in a number of them. I am very grateful to a whole generation of young Chefs who know how to showcase their terroir and their region. French cuisine or world cuisine? French cuisine of course but especially world cuisine. An anecdote about your career? My profession only makes sense when I share my passion with others. When I go to the market, I just can’t stop myself from offering advice to people I meet. Thank you Chef for this interview !